Home of the world famous hippo Fiona. Family friendly Zoo committed to inspiring visitors with wildlife and saving species. A sixteen-year-old Western lowland silverback from the Gladys Porter Zoo in Brownsville, TX, named “Harambe [hɑːrɑːmˈbeɪ]” has joined the Cincinnati Zoo’s gorilla family, bringing the total number in residence to ten. “In the other gorillas’ eyes, Jomo is still the man and Harambe is yet to establish himself. 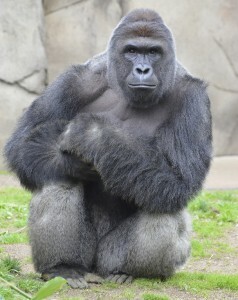 He’s a rookie silverback in camp for spring training,” said Ron Evans, Curator of Primates at the Cincinnati Zoo. Subsets of these groups will be on exhibit in Gorilla World until introductions behind the scenes are complete. After that, the two groups will rotate on and off exhibit. “At 16, Harambe is a young silverback learning his role as a future leader. He got too old to fit in at his natal institution and, like wild gorillas, had to leave the area to find his own way. Matching him up with the socially-savvy Chewie and Mara is a good step in his development. It’s important to have self-assured females as Harambe transitions from teenager to confident and well-balanced silverback. He demonstrates intelligence and curiosity, using sticks and things to reach for items outside his grasp,” said Evans. There are about 765 gorillas in zoos worldwide including approximately 360 in the AZA’s SSP. Western lowland gorillas are critically endangered in the wild, with less than 175,000 individuals. Due primarily to habitat destruction caused by logging, mineral mining and agricultural expansion, wild gorilla numbers continue to shrink. The bushmeat trade – the killing of wild animals to be used as human food – is also a major threat to the western lowland gorilla population throughout the Central African rainforests. More than 1,000 gorillas are illegally poached for the bushmeat trade each year. The Cincinnati Zoo supports wild gorilla conservation efforts like the Mbeli Bai Study and the Mondika Gorilla Tracking Study in Nouabalé-Ndoki National Park in the Republic of Congo. The Mbeli Bai Study is the longest running research being done with wild western lowland gorillas. The research in Mondika allows for up close gorilla observation along with inspirational eco tourism opportunities. Through research, local education programs, publications and documentaries, the Nouabalé-Ndoki Project is raising international awareness for gorillas and their struggle for survival. « Best Time to See Tulips = NOW! Randy Houser to Headline Zoo Brew! Cincinnati Zoo to Adopt Ten Painted Dog Pups and their Mother! So Much Excitement in the Cincinnati Zoo’s Botanical Garden, You’ll Wet Your Plants! Cincinnati Zoo & Botanical Garden, Home of the world famous hippo Fiona. Family friendly Zoo committed to inspiring visitors with wildlife and saving species.